Tickets: Only $25 per person. Hop on Grand Rapids one and only Beer Trolley! Join your ASRI colleagues on Thursday evening for a private group tour of the best breweries in downtown Grand Rapids! 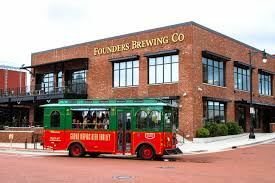 Our time will be spent visiting some of the best breweries out city has to offer while cruising along in our vintage, open air Trolley. Cruise through the historic Heritage Hill neighborhood, in route to our first stop. Stop 1: Brewery Vivant -"17 of the world's coolest breweries to visit in your lifetime"
Head back towards the entertainment district, music and singing of course. Stop 2: Founders Brewing Company- Grand Rapids flagship brewery and nationally acclaimed brews.